Under the direction of Jenna Lebherz Daly, the chorus will perform a wide variety of music. 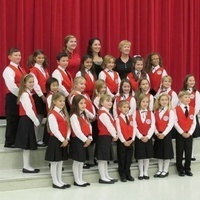 Children's Chorus of Carroll County exists to provide an accessible, quality choral experience for children in central Maryland. Furthermore, it is dedicated to serving the community and helping children develop attitudes that will perpetuate a lifetime of joyful singing. Director Daly attended Westminster Choir College in Princeton, NJ, where she earned Bachelor’s degrees in Music Education and Vocal Performance. She then earned a Master’s in Opera Performance with University of Maryland’s Opera Studio. Mrs. Daly has performed in many states and venues, and she continues to be active in the opera world as a mezzo-soprano, singing for opera companies and orchestras. Currently, she teaches the Lower School Music Program at Gerstell Academy in Finksburg, MD. Free admission; Donations are appreciated. For more information, visit http://www.ccccnotes.com/.